PHUKET: Chef Ronnie Macuja was offered his first job in Phuket while working at a top hotel in New Zealand. That was 12 years ago. Since then, the Filipino has become one of the island’s best chefs, with a string of accolades to his name. He is now the executive chef for the Vset Restaurant, at Chalong Pier, a name that aptly means ‘extraordinary’ in Thai. Chef Ronnie actually graduated from university with a degree in marine engineering. But his true dream was to work in the kitchen, and he picked up an apprenticeship at the Hilton in Manila, before working his way up to New Zealand’s Hyatt Regency hotel restaurant, Top of the Town. 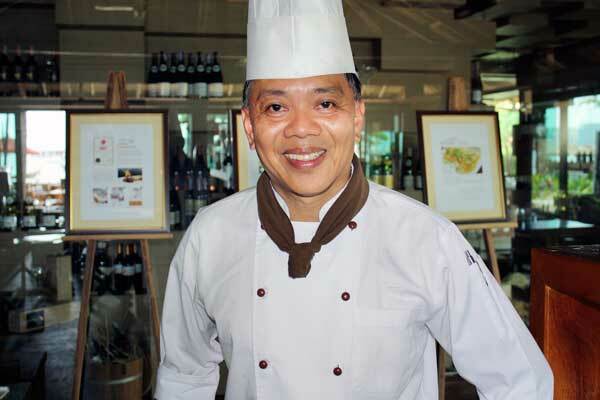 Many years later, Chef Ronnie was approached by Phuket businesswoman Wallee Pachantabutr, who was looking for a head chef for her Impiana Resort restaurant, Sala Bua. Chef Ronnie was at the time working at the Sky Tower Restaurant in central Auckland, where Khun Wallee was a guest. Khun Wallee was so impressed with her meal, she wrote a note to Chef Ronnie to say would he, or any of his team, be interested in taking up the position in Phuket. The rest is history. Chef Ronnie snapped up the offer, and within a month he was preparing the resort’s Christmas Eve feast. He worked at Impiana for 10 years, and as executive chef he won the International Salon Culinaire Competition three times, an international cooking competition designed to test the skill of entrants by giving them a set list of ingredients to produce their creations. The wins were the icing on the cake to his ever growing tally of awards, many of which came while he was working in New Zealand. Two years ago Chef Ronnie started work at Vset, the Pachantabutr family’s new project. The stylish modern restaurant is situated overlooking Chalong Bay. The décor is natural, with dark brown wood combing with a palette of green, and sea views. The food is “modern, trendy, Western cuisine”, with an emphasis on fantastic beef and lamb cuts, cooked to perfection thanks to his New Zealand experience. Excellent taste aside, the presentation is truly outstanding. The dinner menu has a wide variety of meat and seafood choices, including beef, lamb, chicken, duck, salmon, red snapper, king pawn, lobster, foie gras and pork chops. Entrees cost around B250, while mains are priced between B460 and B2,250 (for the excellent Phuket lobster). The restaurant is also open for lunch and breakfast, with plenty of light meal options perfect for a sunny Phuket day. So what is the secret of Ronnie’s success? “Cooking is all about learning, and the learning never stops,” says the always modest chef.